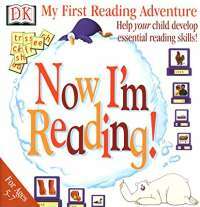 My First Reading Adventure: Now I'm Reading! Launch your child into a lifelong love of reading.Two lovable animated characters White Bear and Little Penguin guide your child on a thrilling adventure that will foster a lifelong love of reading. The games along with a stationery section and two interactive storybooks are carefully structured to adapt to each child's ability building their confidence and developing essential pre-reading skills as they play. Give your child the foundation they need to succeed in reading. Key Benefits: Helps identify letter sounds and spell words containing many spelling patterns; Develops awareness of simple grammar and punctuation; Intelligent software adjusts every game in response to individual strengths and weaknesses; Includes printable worksheets and built-in progress tracking. Help is always at hand Penguin and Bear offer advice and encouragement and always make you smile. Learn many spelling patterns. Drag letters to complete each word. Read sentence clues to solve words. Bee a word detective as you hunt down the picture that matches the clues. Instantly recognize frequently used words. Learn to identify words in this quick fire matching game. Develop word order and punctuation skills. Place jumbled words in the right order to build sentences. Enjoy reading. Practice newly learned reading skills with two charming Penguin and Bear storybooks.